Brittany Ferries said it got an unexpected bonus from rival Irish Ferries’ decision to pull its Rosslare route to France. The French company reported a 12pc increase in the number of passengers on its Cork-Roscoff route in 2018, compared to the previous year. The Ireland-France route, carried more than 97,000 passengers last year. But the decision by Irish Ferries has been an unexpected bonus, with many holidaymakers in the south of the country, not keen to travel to Dublin, instead opting for Brittany Ferries’ Cork services. Briefing journalists in Dublin, management said overall ferry bookings are up 16pc this year, helped by the addition of the line’s Cork-Santander route, which is proving popular with the Irish heading to the south of France and the Barcelona region as well as the northern coast of Spain. The new route, served by the Connemara, also allows for an additional weekly return sailing from Cork to Roscoff. 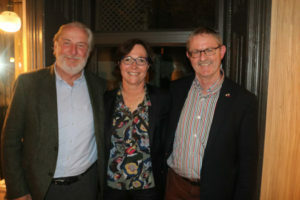 The company said that while the Connemara has a no-frills service, it offers more opportunities for shorter breaks, with passengers now being able to head to France on a Saturday on the Pont-Aven and return overnight on a Tuesday Connemara sailing. Speaking at the official launch of the 2019 Irish season, Hugh Bruton, General Manager, Brittany Ferries Ireland, said: “We are pleased to report another strong year of growth and an encouraging start to the sailing season ahead. It is fantastic to see both new and existing customers recognising the many advantages of ferry travel and appreciating the wide variety of holiday options that France and Spain have to offer. Joëlle Croc, Brittany’s Group Director of Sales and Customer Experience, told Travel Extra that “2018 was a good year for us”, carrying a total of 2.6m passengers, which is up more than 2pc. She revealed that the group’s new Honfleur ship, which will sail the English Channel, will be full of digital innovations – thanks to Dublin Tourism. “We were at their office three years ago and we’ve been inspired by that place,” she said. The ship will feature digital screens showcasing the destinations it serves – including Ireland – with itinerary tips for holidaymakers. Honfleur is one of three new ships on order (with more to come) as part of a €450m investment. Two ships, including Honfleur, will be powered by LNG (liquefied natural gas), which reduces sulphur, particulates emissions and cuts average carbon dioxide to about 20pc. The full range of 2019 holiday packages are now available at www.brittanyferries.ie/holidays. Bookings can be made either online at www.brittanyferries.ie or by calling 021 427 7801.